The main purpose of my last visit to Khartoum in January was for me to install and commission financial management software and teach a number of staff in using the Programme. I was also charged with improving reporting methods. 36 hours before departure I still hadn’t received my entry permit. When it did arrive it came with a “health warning”: The authorities had imposed a requirement that I should be accompanied at all times by a “man from the security” – even staying in the hotel with me. It seems reasonable to assume that they had suspected that the purpose of my visit was to evangelise. Now those of you who know me understand that I’m not one to be demonstrative of religion; in fact if the truth were known I struggle sometimes with my own faith! 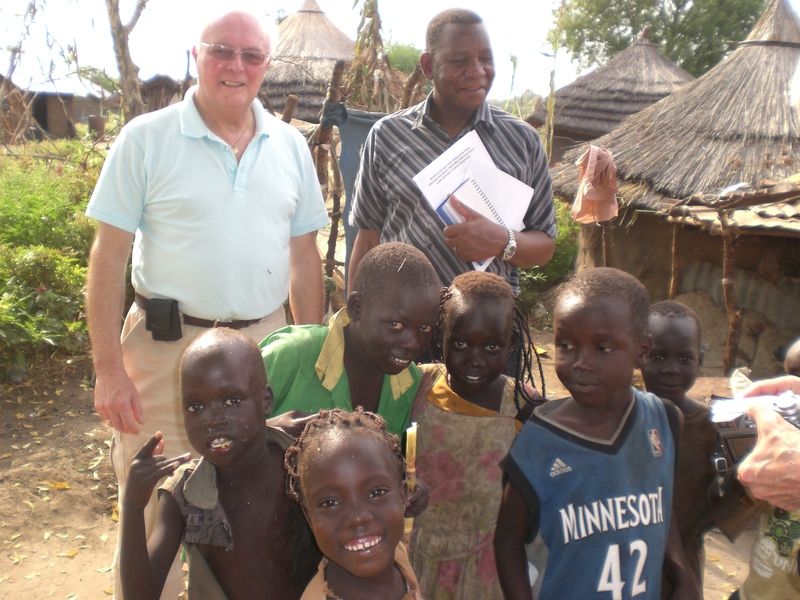 During the visit I found evidence of substantial persecution of the Catholic Church in Sudan. This spills over to the SVP as it is seen by the Authorities to be inextricably linked to the Church – even though our work is carried out without any discrimination through ethnic origin, sexual orientation or religion. We simply help the poor in the best way we can and without question. In the UK and Europe we are blessed with the freedom of movement and the ability to express our views without fear of recrimination. We never give a second thought to what it must be like to live in a country which is ruled by a government who mistrust everyone. In stark comparison the visitor to South Sudan is met with broad smiles and a good natured welcome wherever he goes. It is difficult to believe that the population of South Sudan has come out smiling after years of bombardment, death and destruction but smiles are in abundance – even in the poorest of the poor. In any war there are casualties but here they’ve suffered more than their fair share. Evidence of care and compassion in our members is in abundance. The Society is fully aware of the need to separate the basic Vincentian work through one-to-one contact, and the development and management of major support programmes which help masses of people. Although baby feeding centres stop babies from dying, and medical centres cure illness, it is vocational training which is providing people with the ability to help themselves through improving their skills. The effects of this programme are exponential in growth as people who have been trained pass on their newly acquired skills to others. So why is the SVP doing the work of Government? I hear you ask. The government has its work cut out to rebuild the infrastructure needed and priorities are roads, provision of reliable sources of power etc. A few days before we arrived, the country ran out of petrol and diesel – although they have the oil they can’t refine it! As a consequence the oil has to be pumped huge distances through Sudan to Port Sudan on the Red Sea, taken out of the country, refined and brought back in by road through Uganda. Power cuts are frequent; 5 or 6 a day is normal. I am assured by the senior people we have met in Government that at the same time they will be developing social welfare, healthcare, and education but all this takes time. In the meantime we can’t turn our backs on the poor. South Sudan is like a new born baby. Once the umbilical cord has been cut the baby still has to be cared for. Once the SVP in South Sudan become recognised as a new National Council in their own right they are still going to need our support for many years to come. Thank you dear reader for your interest and kind words of encouragement. If you would like to know more about the SVP Twinnage Programme please got to http://www.twinnage.org.uk/ I’ll be posting a full report on this website within the next few weeks.